© Posted on December 18, 2017, by Michael E. Newton. Anyone who has read a biography of Alexander Hamilton has heard of James Lytton. James Lytton married Ann Faucett, the sister of Alexander Hamilton’s mother Rachel Faucett. When the Hamiltons arrived on St. Croix, James Lytton helped them by giving Rachel Faucett “six walnut chairs with leather seats.” When Rachel Faucett died, Alexander Hamilton and his brother were taken in by Peter Lytton, James Lytton’s son, and then by James Lytton when Peter Lytton died. We know all about James Lytton’s life: his purchase of a plantation on St. Croix, his successful management of it, his selling the plantation, his death, and the deaths of his family members (the best coverage of this topic to date is H. U. Ramsing’s 1939 essay, but I have found additional information which hopefully will be shared in future blog posts and/or a forthcoming book). But what about James Lytton’s past? Who were his parents? Did he have any siblings? Leaving five hundred pounds for his daughters, providing for their maintenance and education, giving one-third of his estate to his wife, and yet having enough to bequeath the largest share of his estate to his only son, it is clear that John Lytton was quite wealthy and that James Lytton’s inheritance must have been in the hundreds and probably thousands or tens of thousands of pounds. A power of attorney accompanied the above will. In it, “John Browne & Sarah Lytton Guardians of the Bodys and Estate of James, Sarah, Anne, Mary, Parnall & Francis Lytton, Orphans of John Lytton of the Island aforesaid [Nevis] Planter lately deceased” appoint “John Mills of the City of London Merchant” to be their “True and Lawfull Attorney” to collect any relief funds that may be issued “for payment of the Damage done the said John Lytton by the French Invasion” of Nevis. 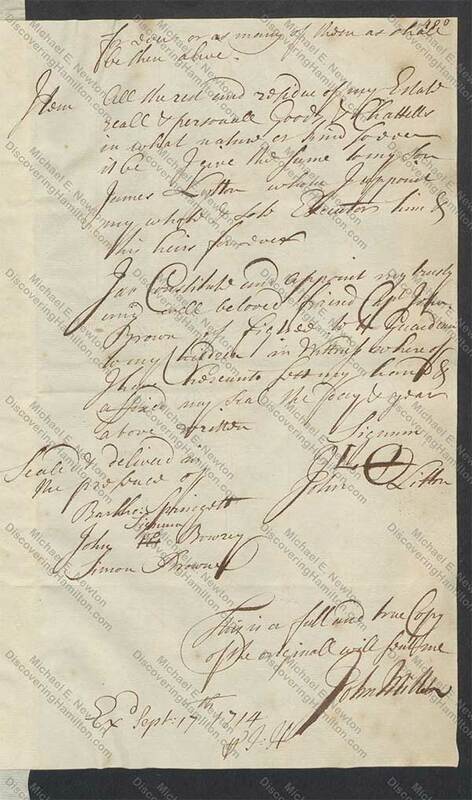 This document was dated the “Twelfth Day of June in the Thirteenth Day [Year] of the Regime of our Sovereign Anne,” i.e., June 12, 1714, and executed July 28, 1714. Thus, John Lytton passed away shortly before June 12, 1714. 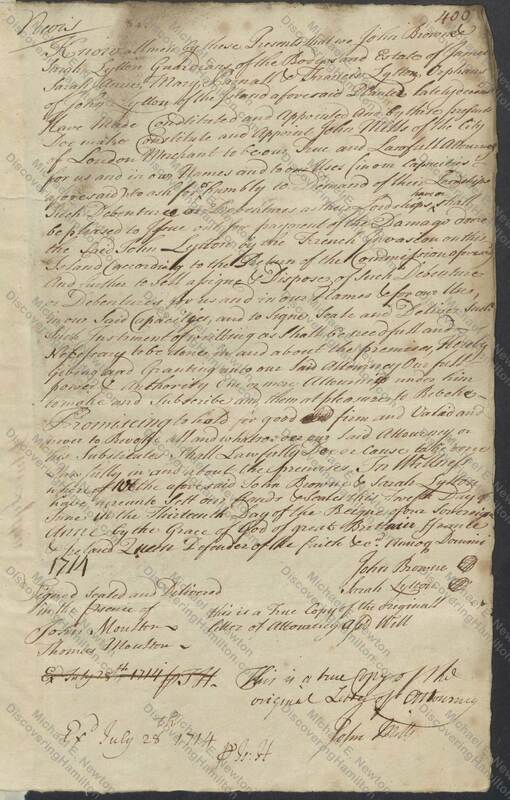 A few months later, on September 17, 1714, John Lytton’s will was executed (see last image of will above). 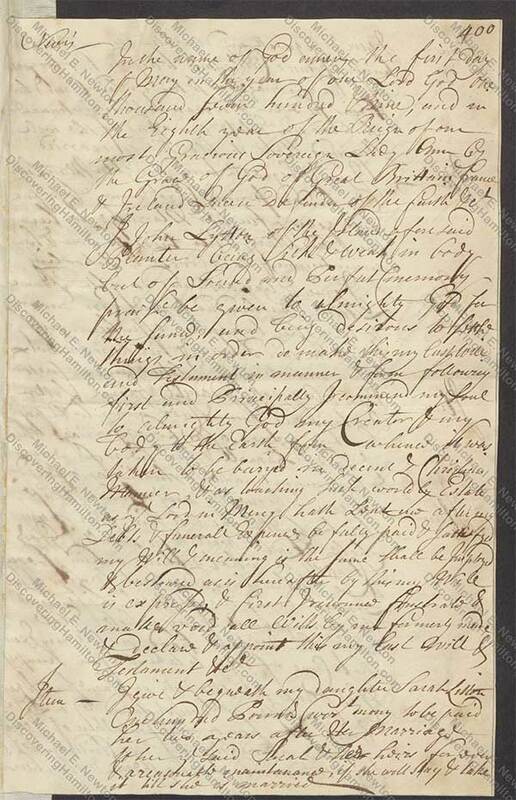 In the same set of documents regarding the French invasion of Nevis that I presented two weeks ago, John Lytton claimed a loss of £972 17s and in August 1713 was granted £324 5s 8d in relief, more than double the average and about ten times the median of all those submitting claims for losses, making him one of Nevis’s most prominent citizens. The relief funds were received in September 1714 by the abovementioned John Mills, the attorney of Sarah Lytton and John Browne, guardians to the Lytton children. * I would like to thank Rhiannon Markless (www.legalarchiveresearch.com) for locating and photographing at my request the above documents within the collections of the U.K. National Archives. Thus, when the pre-teen James Lytton inherited his father in 1714, he suddenly became one of Nevis’s wealthiest citizens. And when Ann Faucett, Alexander Hamilton’s aunt, married James Lytton “around 1729 or even earlier,” it represented the combination of two of Nevis’s leading families—the Faucetts and the Lyttons. NB In his will, John Lytton writes “my daughter,” “my son,” and “my six children.” He never refers to his wife, Sarah Lytton, as the mother of these children. The power of attorney refers to Sarah Lytton as a guardian to the children, but not their mother. 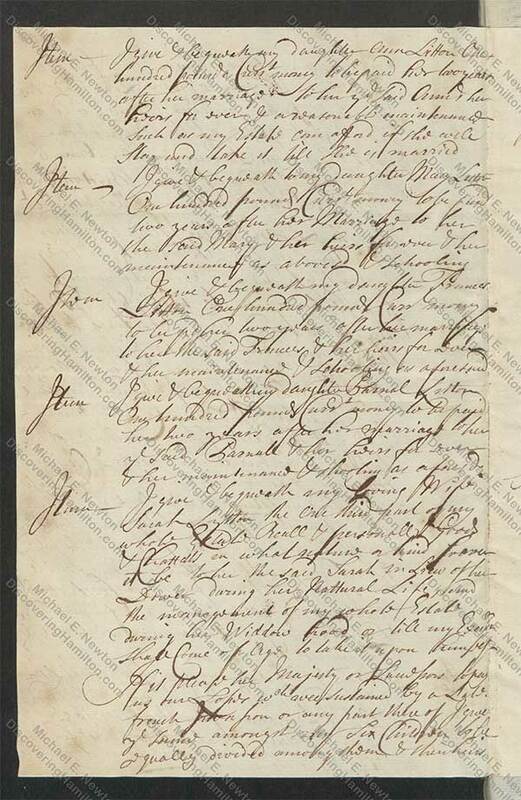 It would seem that the Lytton children were the offspring of John Lytton but not of Sarah, but it is possible that the document’s use of legal terminology merely conceals Sarah Lytton’s motherhood. PS With the upcoming Christmas and New Year’s holidays, the next blog post is scheduled for January 2, 2018. 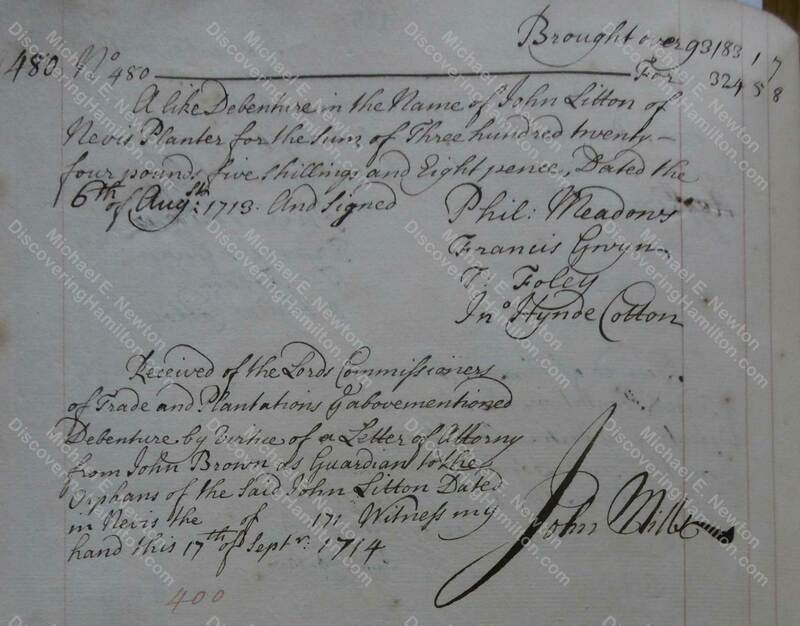 According to James Lytton’s burial record of August 12, 1769, he was 67 years old and thus born in 1701 or 1702.